1) Begin by stating that a Taylor Series is an expansion of a function into an infinite sum of terms. My only concern is: Is this too much for a 12-15 minute demo? Caveat: I'm just a random Internet poster, not an instructor, so take this with a grain of salt. And get some advice from blooded veterans. A. It's too much. 1 and 2 are plenty for 12 minutes. B. Write out the entire 50 minute lecture, practice it at once, and write up a synthesis of the last 35 minutes. I suggest something like topic, time, key points, perhaps purpose (you can draw a 4 column table and fill it out in the 3 minute). Make it simple enough so that you can actually explain it in 2 minutes. Test yourself to see that you can (it is simple enough summary). D. Remember that your target audience at a juco is not math superstars. They are a lower skill set than you or even than an AP calculus class. Good people who want to get through this to support their chem/physics class or nursing degree or what have you. They are looking to progress and get jobs or to transfer to lower level state schools (and then get jobs). Have some sympathy for this and for them (without being obvious or patronizing about it either). F. Do a little reconnaissance and figure out what text they use. See how it addresses this topic and work the homework problems in that text. G. Really this whole topic is a little bit of a pain for the student and not the most important material. Maybe even why they picked it. Show you can get the kids through the damned thing. Your intuition is correct that this is far too much for a 12-15 minute lesson. The committee knows that there is no way you could deliver a whole lesson, even an introductory one, on this topic. Since you've only got 15 minutes, plan to use it to spark interest in the topic, knowing that you're only showing the committee the very beginning. 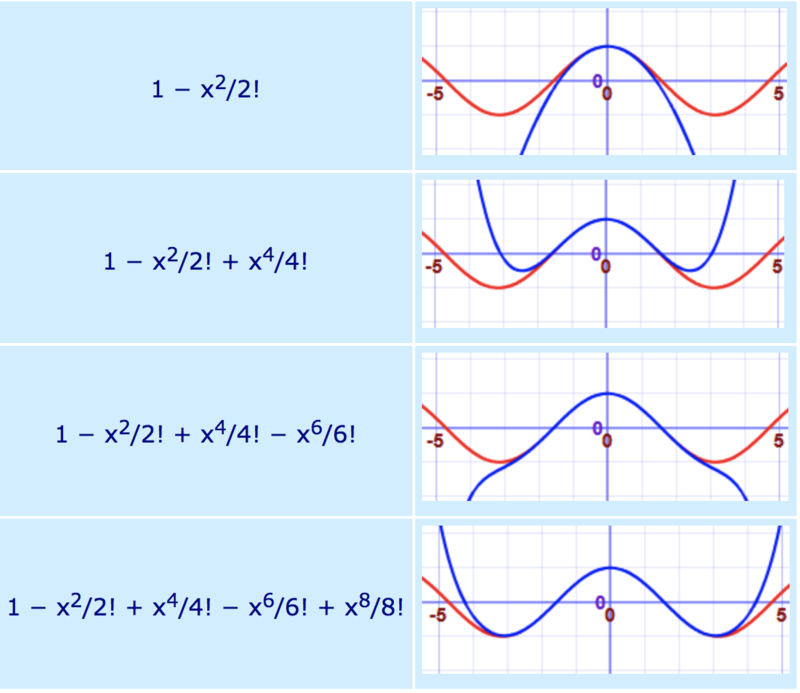 For example, why not show students the cosine function on a small interval around $x=0$, and ask them what polynomial it reminds them of? "Does it look like some kind of $x^2$ or $x^3$?" Let them decide which one, and then graph their guess on top of $y=cos(x)$. You will have the opportunity to discuss the vertical intercept and the width of the graph -- that it can be adjusted (by multiplying a term by a constant). In this way, your lesson could start as a game about building the cosine function from simpler functions, and students will be involved in the guessing process. I see this occupying up to 5 minutes. Then do your steps 1 and 2, and you're probably out of time. In my opinion, using your lesson time to draw on your students' previous experience with trig and power functions helps them see that they are already capable of doing much of the intuitive work leading to Taylor polynomials, and it validates that this new thing is something that doesn't have to seem like just applying another magic math formula. You could considerably simplify this assessment (for an introduction) by asking them what just the first term of the series expansion should be. If you took the time to remind them of the "long-run behavior" of a polynomial when you discussed the cosine function, you could let them use their calculators to determine what the 2nd term of the series expansion of $sin(x)$ is. I'd take an entirely different approach, though the faculty that is assessing you may not view it favorably. Mathematicians tend to view the logic of math as intrinsically beautiful. The vast majority of people do not. The vast majority considers math to be hoop jumping and weirdly arbitrary rules that must be followed to get check marks. They have no idea why anyone would care about formulae. Simply telling students "Taylor Series are important!" does not motivate them. Glossing over it or lecturing them for a few minutes on it will also fail to motivate them. To begin addressing this, I would use intellectual need to motivate the students. For example, in lower levels of math, one might teach fractions as part of a whole or something like that, or sections of circles, or naming amount of food. Or, you could make them feel intellectual need by having them how they'd share 5 pieces of licorice among 3 kids and name the amount each kid got. One could teach exponents as repeated multiplication then do a bunch of notational drills. Or, you could make students feel the need for exponents by teaching them about the spread of infectious diseases. "If 3 people are infected initially and each sick person infects one more person each week, what will happen in 6 months?" Then, you make a table, and let them struggle for a while to figure out that in week, say, 10, they calculate the number of infections by going $3\times2\times2\times2\times2\times2\times2\times2\times2\times2\times2$, which is just a pain to read and write. In the eyes of most mathematicians, the average person, including college students, have shockingly little interest in the logic of math because they just want to get answers and check marks. So, what will you do to make them feel the need for a Taylor Series? Check out the work on "Intellectual Need" in math education. The risk: The "Curse of Knowledge" unfortunately, implies a very high probability that the people assessing you assume that students will intuitively understand that Taylor Series are interesting and important, and thus just need to be told so. Experts, very frequently, are shocked to find out that basic concepts, such as why anyone cares about Taylor Series, completely fly over the head of students who ace quizzes and tests on Taylor Series. Not the answer you're looking for? Browse other questions tagged community-colleges or ask your own question. What is the evidence about the effectiveness of remediation in math?